It’s… Peanut Butter Kelly Time, where you at? (Now you’ll have that in your head on repeat for the rest of the day. You’re welcome.) PB Kelly Time has been with the Rose City Rollers for quite some time, she loves this league and community pretty fiercely. Like many, this is PBK’s second home, a place to learn and grow. PBK is receiving the Gold Star Award for Volunteering, for her skills on the heat press, getting out fresh pressed jerseys for the numerous skaters in our league in a timely manner. Unfortunately for us, Peanut Butter Kelly is moving on for now and taking her kind smile and fierce derby skills to another city. 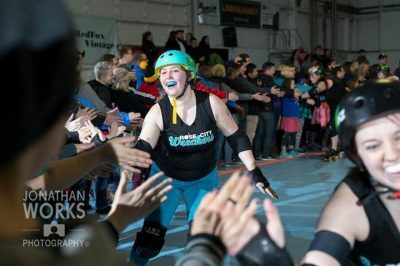 We here at Rose City Rollers wish you the best PBK, you will be sorely missed. Congratulations on your award and your next adventure. Why have you stayed involved with RCR? What has being in RCR volunteer meant to you? What was your favorite volunteer experience? scrimmages is often met with similar excitement as skaters get to wear their number and actually play roller derby for the first time after months of hard work and practice. How does it feel to be a Gold Star Award for Excellence in Volunteering winner? I am so humbled to win this award. The volunteers who have won in the past have contributed so many hours to this league and have done amazing things. I feel loved that my league mates would think of me when considering nominees for this award. There is a lot of behind-the-scenes work that goes into making heat press operations run smoothly and sometimes being on Team Heat Press means standing in front of a 350 degree metal plate when it’s 100 degrees in the hangar. I am proud of the procedures I have put in place and the shirts I have created and I appreciate being recognized for doing this job. Just try something. You might not end up liking the first job you try but along the way you will figure out what you do and don’t like about volunteering that will help you determine what kind of job you do want. You will also make friends and build community, learn about volunteer roles you didn’t even know existed, and find yourself wanting to get more involved. Huge thank you to Rodent for teaching me everything I know about heat pressing, Gnar Wall for being an amazing co-manager, and Feara, Starknado and Tessa for being a fabulous heat press team. I may be heading to the Midwest for now, but I am a Wrecker For Life.